The Zeagle Base BCD is a highly durable jacket style BC that has been adapted to the needs of diving resorts and rental programs. The Base is a unisex front adjustable jacket style BC made from reinforced and fade resistant Cordura 1000 denier nylon material on bladder, shoulder straps, harness and pocket material. The bladder is internally urethane laminated with radio frequency (RF) welded seams for airtight integrity. 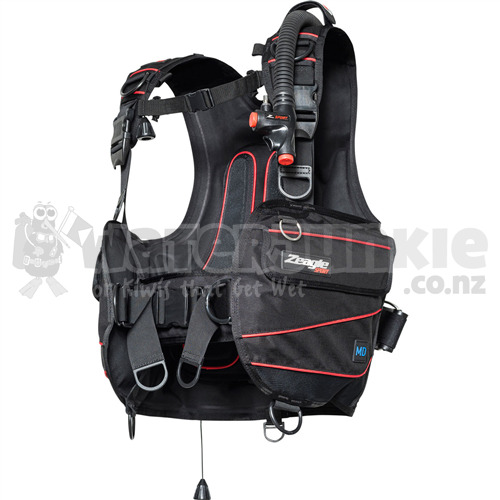 The BCD's harness is made up of a dual position adjustable sternum strap, webbed cummerbund with dual adjustment, torso adjustable shoulder straps, adjustable, sternum and waist straps. All straps are equipped with squeeze-style" side-release buckles for quick and easy donning and doffing. The Base BCD is equipped with two stainless steel and two plastic D-rings along with one retractor D-ring, accessory webbing hook and two Velcro closure utility pockets for attachment and storage of accessory items. Buoyancy control is made easy with the right shoulder and rear right overpressure relief/pull dump valves and Zeagle's Power Inflator System with 3/8" threaded quick-disconnect low pressure hose. The inflator is also connected to a pull dump valve for rapid deflation. The Base BCD provides 24 lbs. (10.9 kg) of lift capacity. This Jacket style BCD has an extra soft back pad for increased comfort, a dry weight of 6.6 lbs. (3 kg), and is made in the USA.